I see many analysts that try to find patterns by looking at charts, but they do not understand what these patterns are supposed to mean. If used and understood correctly these patterns should simply be graphical illustrations of the supply and demand dynamics that are occurring in the markets. They aren't magical or mysterious. 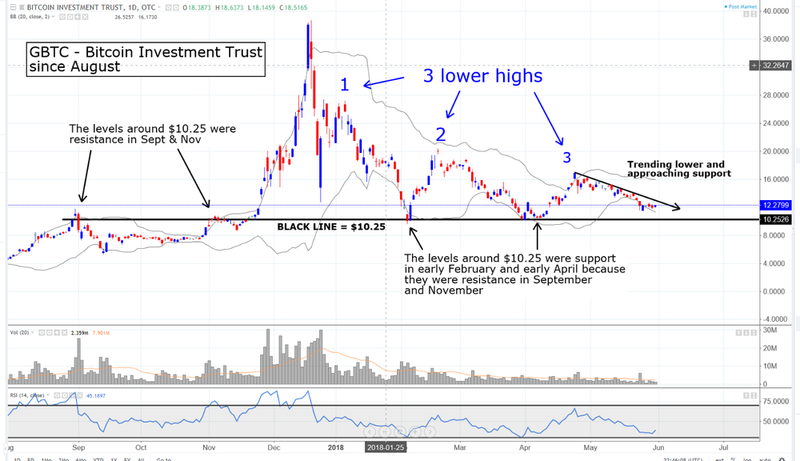 For example, take a look at this chart of GBTC...the Bitcoin Investment Trust since last August. First, you don't need to be a Market Guru to see that the levels around $10.25 are clearly important. There were resistance last November before the huge melt up and they were support in early February and early April. It is also the level that the market turned at last August when it became overbought after gapping up. Why does this happen? This is a remarkable phenomenon, How can a stock have the exact same valuation at different times? Interest rates have changed, the economy has changed, other valuations have changed yet the stock is at the same prices. Fundamental analysts, academics, and random walkers will have a hard to explaining it. But it is clear that in markets certain levels are more important than others with regards to the amounts of supply and demand that exists at them. In this case those who bought the stock around $10.25 told themselves they should have bought more after it rallied. Those who didn't buy it told themselves that if it came back to those levels they would buy it, so the market has a memory at this level. My guess is that if it trades back down to that level it will once again find support in the short-term. This is where the forces of demand start to overpower or at least become equalized with the forces of supply. Second...you can see how since the peak in the high $30s in December was followed by a succession of three lower highs...in January, February, and April. This is a pattern that traditional technical analysts call a 'descending triangle'. There is nothing mysterious about this. It is simply a graphical illustration of the dynamic that as time passes, the sellers are becoming more aggressive...meaning that they are willing to accept lower prices. Buyers are less aggressive and as time passes they are willing to be patient and stay at the same levels...around $10.25. Descending triangles are bearish patterns and this means that the $10.25 level will probably break after being tested again. Traditional analysis says these patterns play out about 2/3rds of the time. There is also another lesson to be learned here. When analyzing charts it is important to view both the standard and logarithmic versions. The first chart is the standard one, and the second is logarithmic. Studying both versions can lead to addition insights. So remember, there is validity to some of the classical chart patterns that are used by technical analysts. But what is more important than mindlessly memorizing the names of chart patterns is to understand how they illustrate the supply and demand dynamics that are occurring in financial markets. In the case of a Descending Triangle, it is an illustration of how as time passes sellers become more aggressive while the buyers are patient and content to stay at their price levels. The forces of supply are overpowering the forces of demand. That is why this is a bearish pattern.